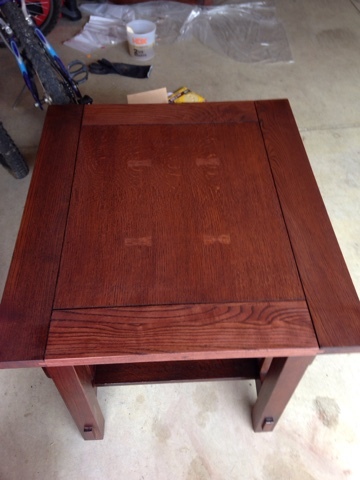 My west coast son had a project for me when I arrived to visit to resurface the tops of a coffee and end tables that he had replaced. He wants to sell them but there were scrapes where the finish was removed. 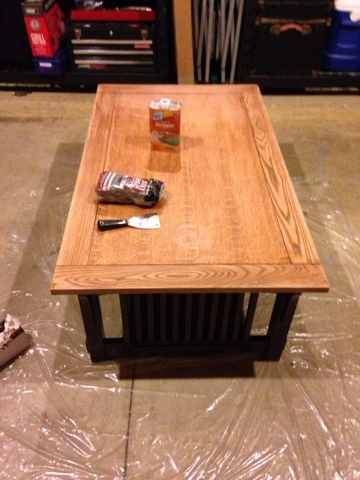 He and I took a trip to Home Depot to buy the supplies to strip and stain to match the color of these well built solid oak pieces of furniture. The pieces stripped easily with stripper and putty knife and then cleaned up with some more stripper and #3 steel wool. Next a light sanding with an orbital sander I picked up for my son as a gift to him as he is about to become a homeowner. 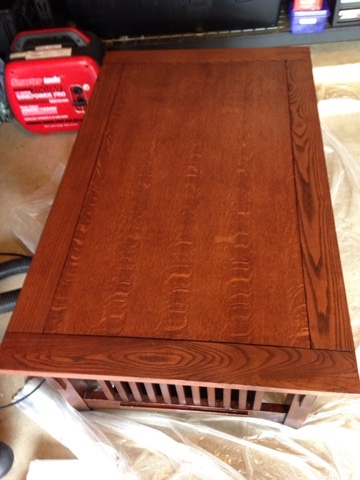 It took a couple coats of stain to get the right darkness. The stain tint matched well out of the can. Unfortunately I didn't finish before leaving Monterey so my son will have to finish the polyurethane coats as I only got two coats applied before heading off to my new adventures.